The Lodge at Giants Ridge is the perfect getaway for a rejuvenating vacation at our beautiful Ridge SPA. Our Ridge SPA offers all the beauty services you want by some of the most professional and experienced beauty experts in the industry. From hair services, skin care, make-up and more to our body treatments and SPA packages, you’ll experience the ultimate retreat and feel completely revived. Give yourself and your husband a beauty boost at the Ridge SPA. He can enjoy a deep tissue massage to take relieve some stress, while you get a great haircut or manicure! After your rejuvenating time at the Ridge SPA, challenge yourself on our new climbing wall! It is perfect for a fun and fitness challenge, but it also makes for a great family or team-building activity. If you’d rather enjoy some fresh air, take a relaxing stroll through Minnesota’s beautiful trails. Start off your journey with a four miles hike on Birches Hiking Trail, the entrance is near the tenth hole of the Legend golf course. If you want to tackle a longer walk take the award-winning The Mesabi Trail, you’ll be fully immersed in Minnesota’s breathtaking landscapes. During your stay with us at the Lodge at Giants Ridge you’ll get reconnected with nature. Being surrounded by so much natural beauty makes it easy to exercise on one of these incredible trails, so grab a bike or tie on your shoes, and join us in beautiful Minnesota. 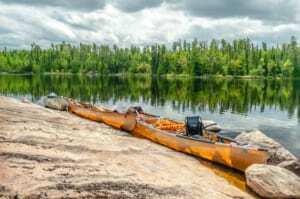 If you want a thrilling excursion to explore the beautiful Minnesota outdoors, book our Motorcycle Getaway and cruise over to the North Shore, or head up to the Boundary Waters, or slide over to the Chippewa National Forest. This will compliment your relaxing time at the Ridge SPA by getting some adrenaline going and the amazing views! You can also go boating and cool off on one the Lake, like Wynne Lake, Sabin Lake, or Embarrass Lake & River, after all, it is the land of ten thousand lakes! You can enjoy some water activities like canoeing, kayaking, and paddle boarding, or just float and soak up some sunlight! After your relaxing stay at Ridge SPA and thrilling motorcycle rides, you’ll be ready to kick off summer and bring your friends and family to The Lodge at Giants Ridge.